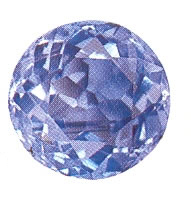 All sapphires belong to Corundum family and occur in various colors. Their composition is aluminium oxide with a hardness of 9, and it belongs to the trigonal system. Blue sapphire gets its coloring from iron and titanium. The other colors are due to varying amount of these minerals as well as chromium and vanadium. Its deep, penetrating light emits rays of pure devotion, which speak to us of cosmic influences, higher mystery and infinite reality. The blue sapphire is very much healing on the throat center, which is the center of purity, where thoughts and words are cleansed. The throat chakra is our contact with the universe, and very important in developing our consciousness, our thoughts.